I have no great shame in admitting that Meall Ghaordaidh was always going to be over shadowed by the two outings either side of this particular Saturday, the 24th February 2018. Two weeks earlier was a weekend to remember out camping high south of Ullapool on the Beinn Dearg four Munro circuit - Read full report here. The Sunday straight afterwards was a tremendous solo outing doing the Beinn a'Bheithir ridge from Ballachulish (Walk Report to follow), I will keep this brief (well as brief as I can), much like the actual outing itself . With the Beinn a'Bheithir ridge located in South Ballachulish, Glencoe, making such a long drive from Aberdeen I opted to break this up by going down to my parents in Stirling and heading up north west from their house on the Sunday. 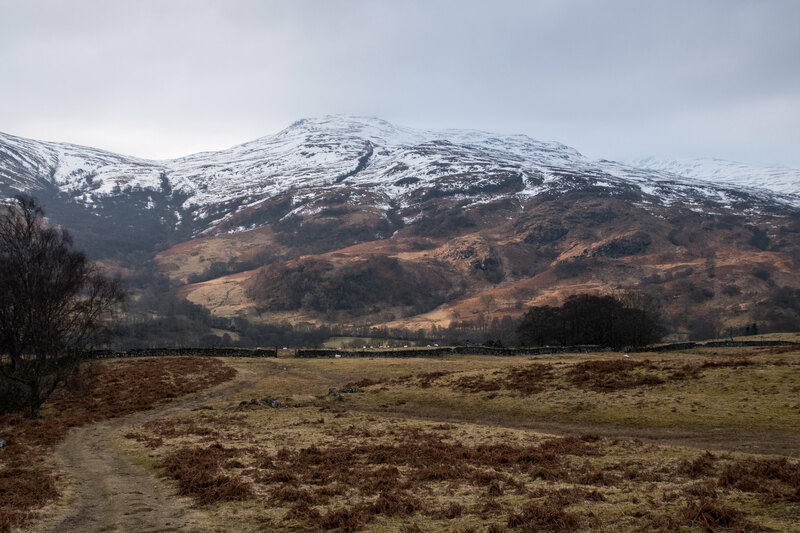 It seemed like such a waste to spend the Saturday just driving to Stirling (and it is such a dull road ) - so why not turn another Munro from red to blue?! 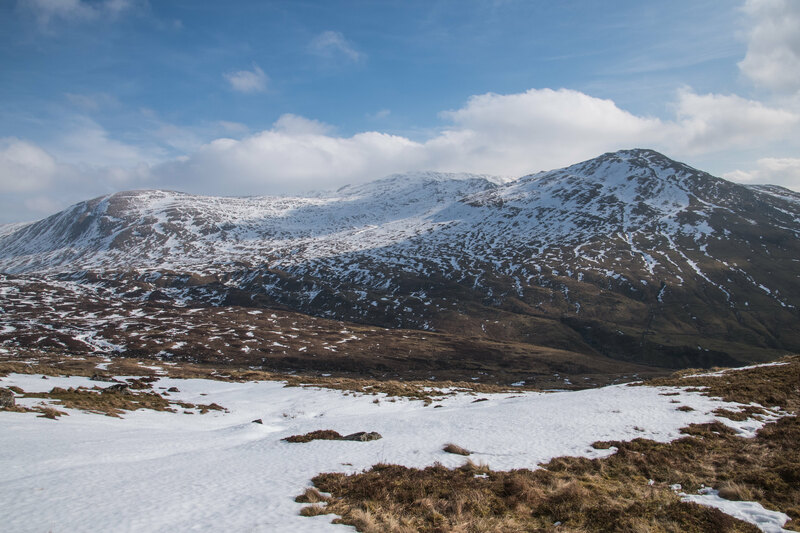 The original plan was to do Meall Corranaich and Meall a'Choire Leith from the Ben Lawers car park but Meall Ghaordaidh was always a potential back-up given the road to Ben Lawers being notoriously icy. By the time I was heading into Aberfeldy the main road was already slightly challenging and by the time I reached Kenmore the original plan was so far out the window it left me with my only hope of the road from Killin to Meall Ghaordaidh being passable. Setting off from the car at 09:00. It was a gentle start to the day and it felt good to be out again on my own. 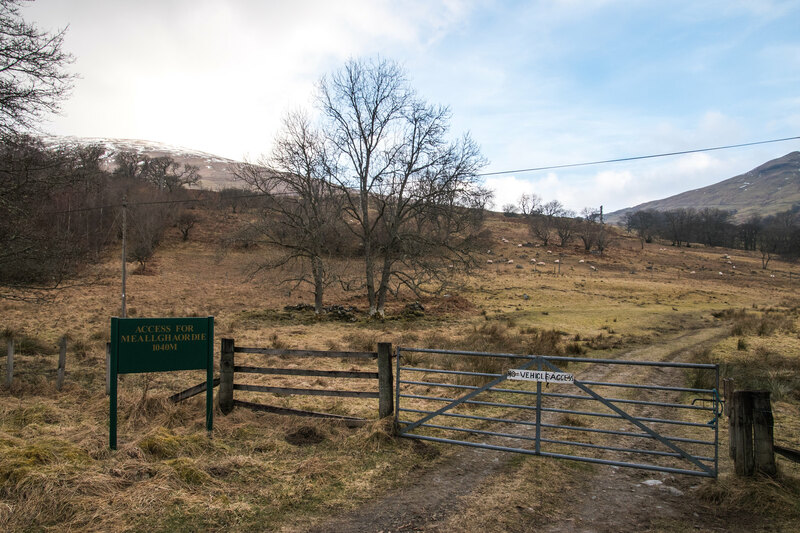 Although there was nothing special to note from walking through the farm fields it was particularly peaceful - the gentle sound of the Allt Dhuin Croisg making progress towards the River Lochay and the abundance of sheep barely noticing my presence. I think the best views from the day were nearly always looking back towards Glen Lochay and what I believe from looking at the maps to be Beinn Bhreac? By now I have let the cat out the bag and you will know I had no summit views; I am led to believe from other reports these views can be quite vast and spectacular. The day started off with little to no snow and as the summit of Meall Ghaordaidh was well hidden by both the angle of the incline and the cloud hat it was wearing. With so little visible snow I very nearly opted to leave crampons and ice axe in the car. Thankfully I took the extra weight just in case! By the time I had reached the bottom of Meall Ghaordaidh's cloud hat I was glad I had my crampons and axe. In fact I probably would have bailed out if I had left them in the car (how annoying would that have been!). I still hadn't seen anyone on the hill and the snow had been compacted to solid ice making it difficult going without the extra spikes. In hindsight I also appeared to have taken a very slightly more direct route (righter than normal) in the final approach to the summit from 950m to 1039m. This was challenging to say the least but it was good practice with the crampons on. 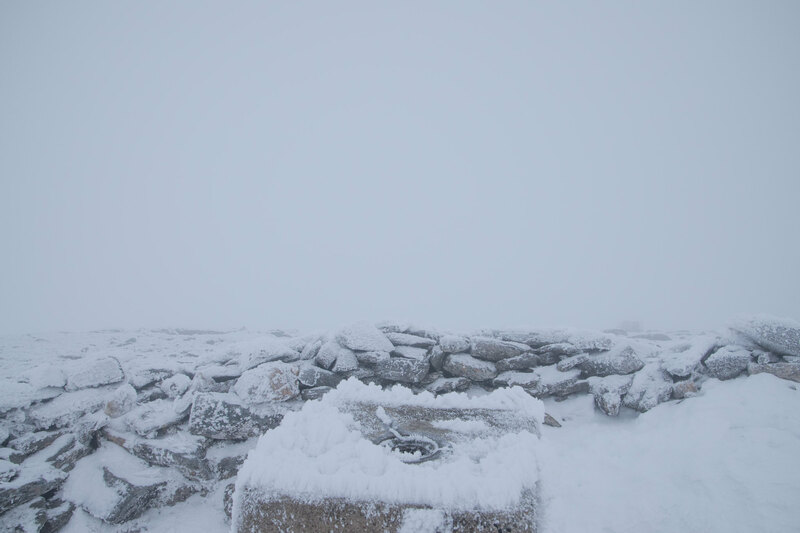 View at roughly 940m - summit somewhere ahead. It had only taken two hours to get to the summit, but as it was now 11:00 I was starting to get very hungry. 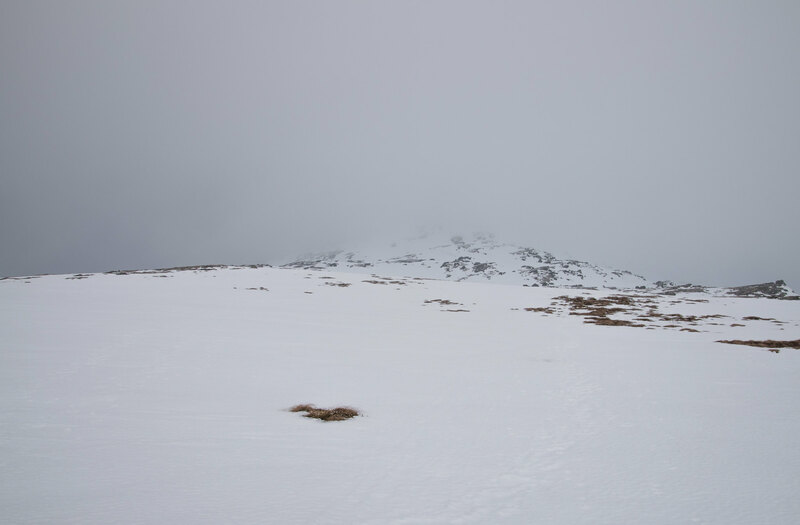 I thought about hunkering down to get some food but the relatively peaceful weather on the route up was completely obliterated and the summit of this particular Munro for me was the most inhospitable yet. I struggled to stand in the wind and the wind chill was particularly unpleasant. Without putting on all my layers I would struggle to spend more than 5 minutes at the top. After sitting down for about 30 seconds I decided I would begin the descent and stop for a bite to eat once out of the cloud and with at least some views to enjoy. 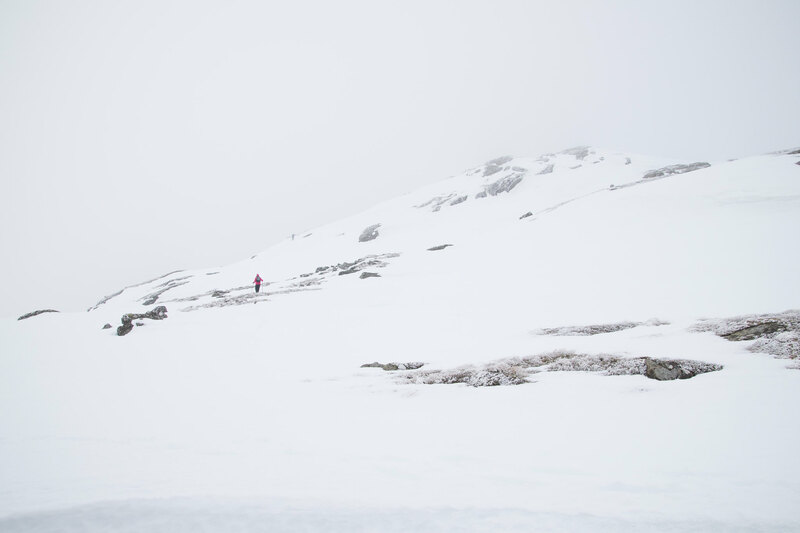 Once down to about 850m, I met another couple who were heading on their way up. Quickly advised that they would be wise not to spend to long at the top and also suggested the may be following my earlier line which proved to be much steeper & deeper snow than my descent choice. The two walkers taking a better line to the summit than me! 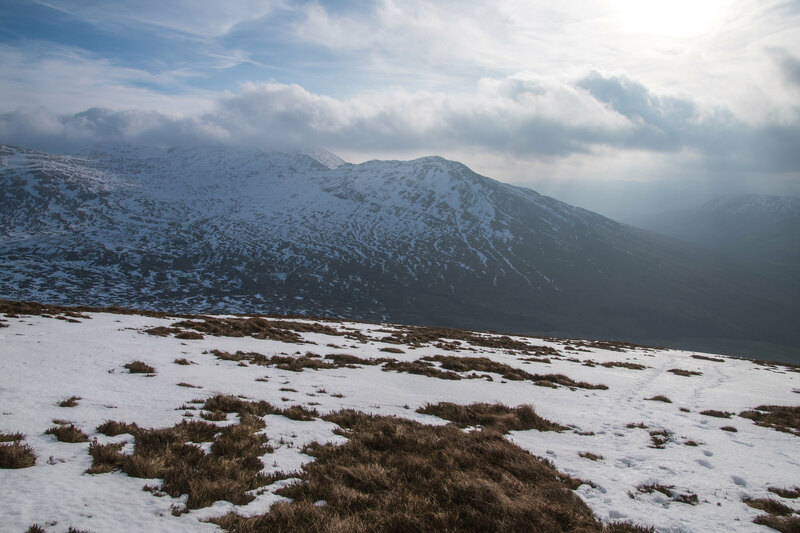 Enjoying some views in the direction of Ben Lawers. When I was thinking of possible titles for the Walk Report during my outing there was nothing that immediately sprung to mind. I often spend myself spending a lot of time during my walks thinking of a report title - is that sad to admit? If it is keep it to yourself . 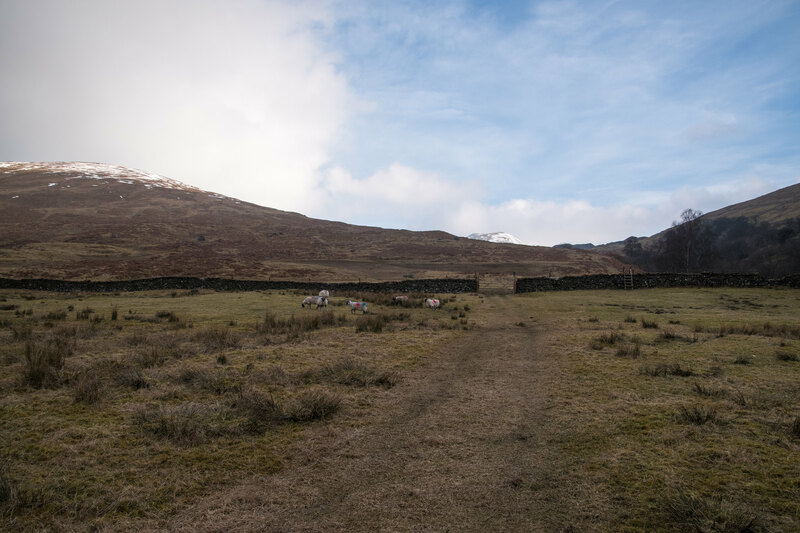 With it surely being one of the easiest day walks, Meall Ghaordaidh will often be one many baggers simply forget about and have little memory, other than the ease and short time it takes to bag. After a couple of minutes the quiet one appeared to get bored of the noisy offender and flew off. 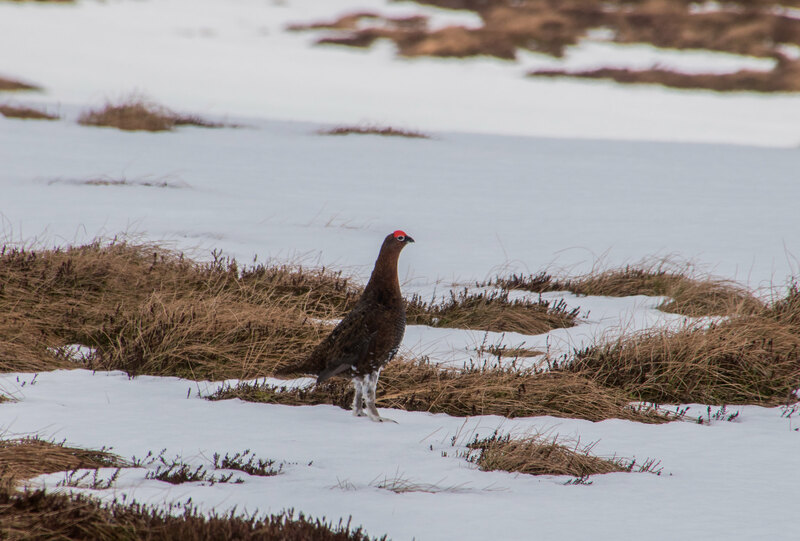 The poor remaining grouse appeared distraught. This may all be a figment of my imagination but it made for more exciting viewing that other more probabilistic series of event. It also sprouted some inspiration for the Walk Report title. The sad solitary grouse of Meall Ghaordaidh. I would admit it was not quite as impressive as a David Attenbrough documentary but being half way up a hill, eating lunch and watching one of Scotland's most well known animals so closely, for such an unusually long period of time is what I will remember this outing as. Additionally when I have some form of memory loss in my old folks home this Walk Report will act as my trusty online memory. After lunch I retraced by steps back to the car and passed at least another 15 people heading upwards - some looking for more prepared for the winter weather higher up than others ! I tried my best not to look smug that I was approaching a change of dry warm clothes and fresh water and food but I probably failed quite miserably at that, so sorry . I was back at the car by 12:30 sharp which mean it took a total of 3.5 hours with a good amount of farting about with the camera. This was really perfect timing as it meant I would be in Stirling before late afternoon, I could stock up on food and get an early night before heading off super early on route to Glencoe and South Ballachulish. In typically Scottish humour the weather improved as I was heading back towards the car. Now that 93 was added into the the bag it was time to look forward to what South Ballachulish had to offer with a 90% chance of cloud free summits . That is the next report to produce, one I must admit I am looking forward to. I will opt not to write anymore as at the time of writing I already have another 2 reports and 5 Munros to write about and a weekend outing planning camping in the remote Cairngorms to reach treble figures . I liked to read your report bringing back memories of my walk in summer. 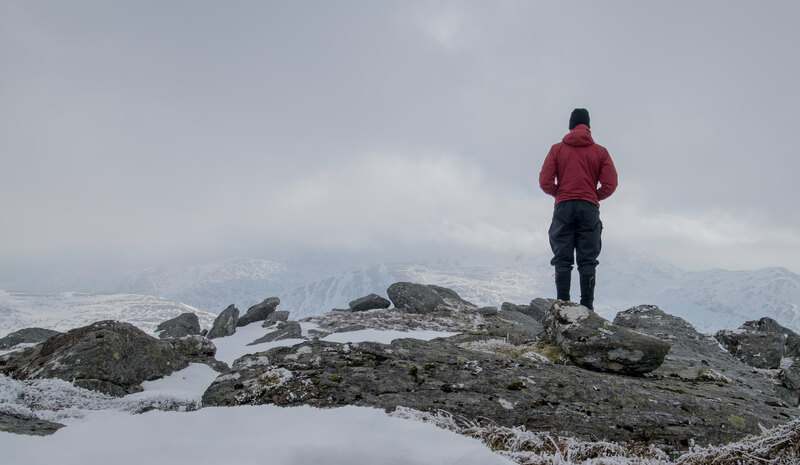 I find it somehow striking how the reports I have read so far about this Munro resemble my own experiences and impressions in some aspects (f. e. the mention of no view of the munro summit, the peaceful atmosphere, the changing of the wheather) although the reports are all different.